Through tussock I initially hike on a fairly well formed track towards Travers Saddle. The higher I climb, the rockier it gets and the more spectacular the views of the surrounding mountains. 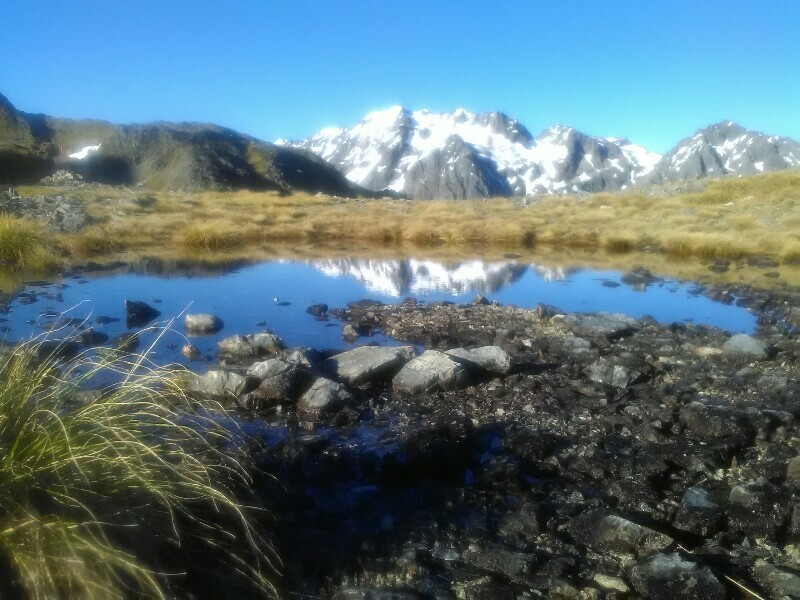 A little tarn on the saddle makes a perfect place for my (this time more modest) breakfast. No wind and the morning sun makes my break at nearly 1800 meters very pleasant - even though it's only 7:30. 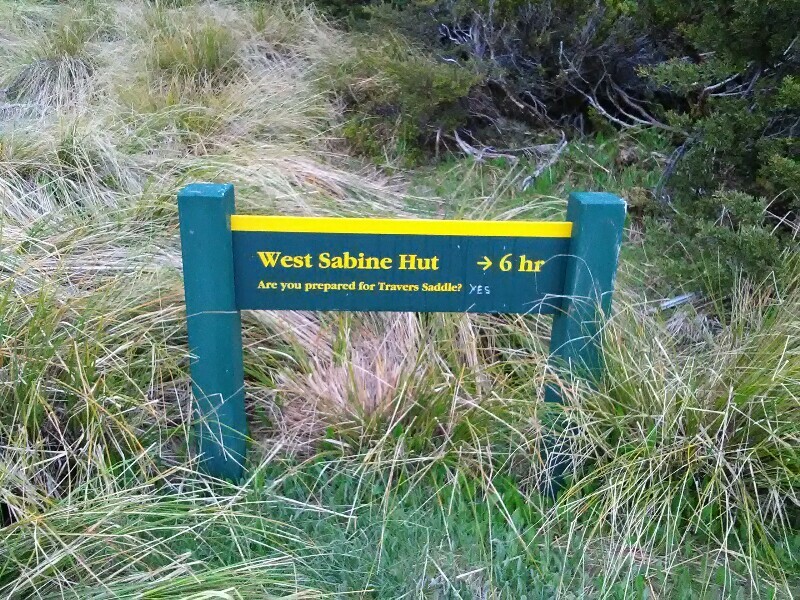 From the saddle, the track drops more than 1000 meter down to West Sabine Hut. While technically easy, it's steep and long. A stress test for the knees. Close to the hut and basically out of nowhere, the track crosses an extremely deep, narrow gorge via a bridge. Spectacular! 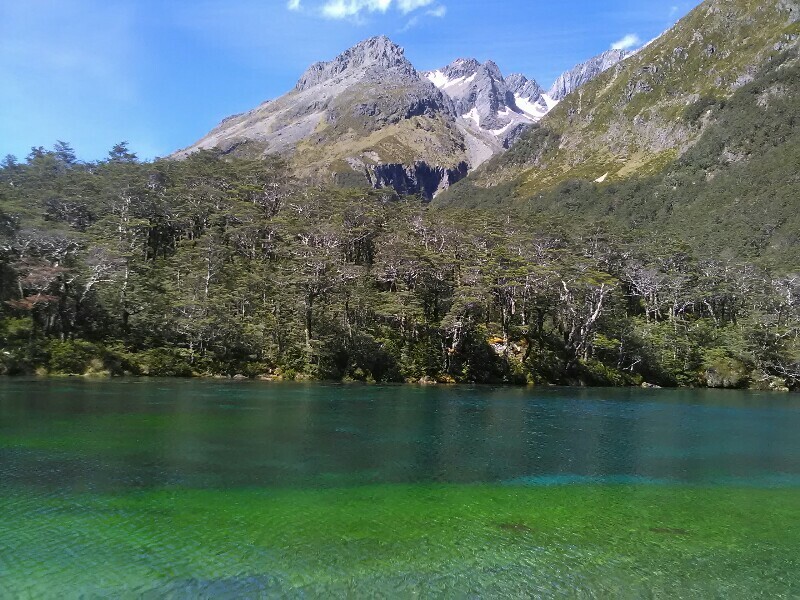 Rotomairewhenua, Lake of the Peaceful Lands or simply Blue Lake, is located a few steps away from the hut. For the Ngāti Apa people, the lake symbolizes the nature of their relationship to their environment. For me, the blue and green shining lake - apparently the clearest of the world - is simply amazing. I'm so happy to marvel at the lake on such a sunny, clear day. Unfortunately, tomorrow the weather won be as gorgeous as today. While the morning is okay, rain, possible heavy and severe gales in exposed places are predicted to develop around midday. And I really don't want to climb over technically challenging and exposed Waiau Pass in these conditions. So what should I do tomorrow? Even though it's beautiful here, I don't feel like waiting for better weather and spending at least another night at the hut. It must be beautiful there, amazing pictures. It looks like that was tough as expected. We are looking forward to your next post. Thank you to let as part of your hike.